Terry O'Neill, founder and president of Constantine's Circus, Inc., is an Albany, New York-based lawyer, public relations consultant and freelance writer. He is the son of a Connecticut State Trooper, the grandnephew of six members of the Bridgeport, Connecticut Police Department and the great-grandson of a County Waterford police constable. Mr. O'Neill, who delights in one-upping Professor Constantine, also counts as ancestors such legendary warriors as Conn of the Hundred Battles, whose name speaks for itself; Niall of the Nine Hostages, who chased the Roman legions out of Ireland, Scotland, Wales, Cornwall, England, the Isle of Man, Brittany and all the way across Gaul to banks of the Rhine; Daniel O'Neill who fought in France with the famed Fighting Irish 69th New York Regiment during WW I; Daniel's son, also Daniel O'Neill who, emulating Niall, in the next war chased the Nazis all the way to Berlin; and Master Sergeant James V. O'Neill who, during WW II at age 26, was the youngest master sergeant in the Army Air Corps and later, in support of an airlift of Jewish refugees to Palestine, a hero of the founding of Israel. Mr. O'Neill himself is a veteran of the United States Navy, as was his late father Joseph and his younger brother Sean. Mr. O'Neill studied Western Civilization at Providence College, earned a Bachelor's degree in English Literature from the University of Connecticut and read Law at Albany Law School. In 1986, Mr. O'Neill joined the NYS Division of Criminal Justice Services as a legal advisor to the state's police executives. He later served as Special Assistant to John J. Poklemba, the state Director of Criminal Justice. He represented the Director in responding to violent unrest on the St. Regis Mohawk Indian Reservation during 1990, playing a key role in the creation of a Mohawk police force. This determined-looking group is the Ulster County Triad. A Triad is a county-level coalition of law enforcement and senior citizens with a mission to provide public safety services responsive to the needs and concerns of the elderly. 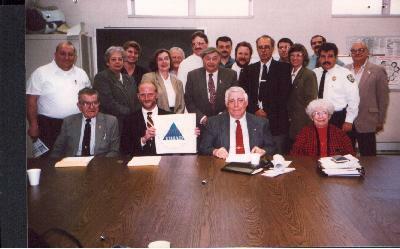 The man sitting on the left is Robert Cutler, who helped organize the Triad and who designed the logo being held up by Terry O'Neill. Though 70 years old at the time, Mr. Cutler had made himself a real computer whiz. Mr. Cutler helped Mr. O'Neill win passage of Chapter 111 of the Laws of 1993, which brought Triad to New York. In 1993, Mr. O'Neill introduced the Triad program of enhanced police service to the elderly to New York. In December 1999, Governor George E. Pataki took Triad statewide by signing a historic agreement with New York's police chiefs, sheriffs and senior citizens. Mr. O'Neill also serves pro bono as Counsel to the Mid-Hudson Crime Prevention Association, the Capital District Coalition for Crime Victims' Rights and the Coalition for Safer Schools. Mr. O'Neill is an advocate for children and in 1990 championed a state law creating a training program for juvenile officers. In 1994 he suggested legislation that created a fund to enhance public education and prevention programs to combat child abduction and exploitation. In 1999, he helped Doug and Mary Lyall, parents of Suzanne Lyall, a State University of New York student who disappeared in March 1998, get Chapter 22 -- the College Campus Security Act -- enacted. Mr. O'Neill is especially dedicated to the welfare and dignity of retired law enforcement officers, the legacy of his friendship with the late Patrick F. O'Reilly, who fought hard for pension equity for his brethren. Mr. O'Neill joined a group of retired Troopers in the 1993 campaign to create a privately-funded monument -- the Gray Rider -- to members of the New York State Police. In 1998, he helped retired and disabled New York State Trooper Paul A. Richter get a law enacted that will raise millions of dollars to fund research to find a cure for spinal cord injury paralysis. He is eagerly looking forward to celebrating the 50th anniversary of the Association of Former New York State Troopers in 2001. Mr. O'Neill has long been writing verses and stories celebrating members of New York's law enforcement community and chronicling the struggle against illegal drugs. His work has appeared in police publications throughout the country. He is the author of a book of children's verses with a message of respect for law and law enforcement officers called Constantine's Circus. A play, several other books and a movie screenplay are currently under development. Mr. O'Neill is a prolific composer of music for the highland bagpipe. Many of his tunes are named for famous cops. His signature tune "Thomas A. Constantine" was published in 1998 by the Irish Pipe Band Association. 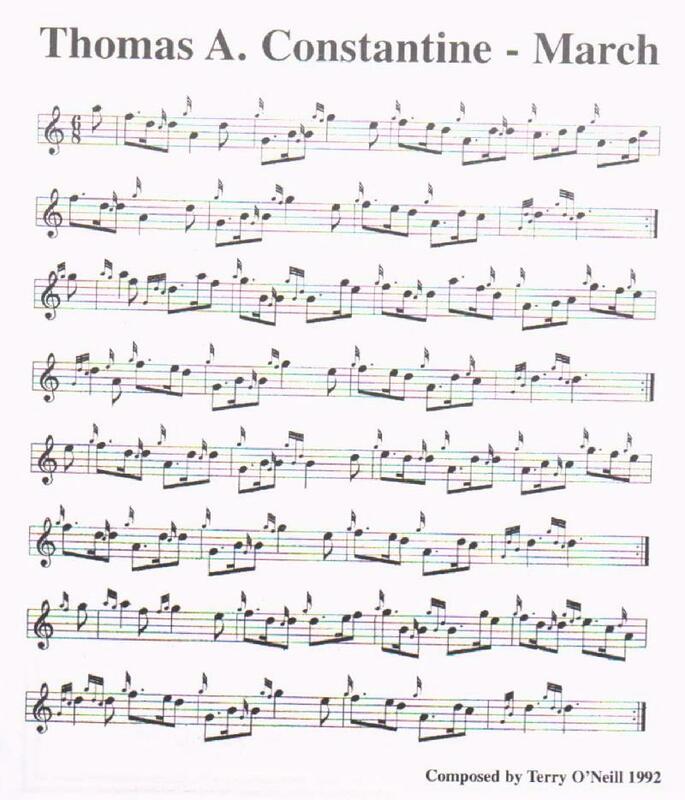 Click here for the sheet music. Of Professor Constantine, Mr. O'Neill says: "He's my teacher -- and that makes him my biggest and strongest and best friend."